Millie has shared her Lysol wipes review, which she uses to clean many areas of her home. Lysol sanitizing wipes are awesome. They clean anything and everything that I have tried cleaning. I am very particular about the cleanliness of my home, and the appearance of it. These wipes are great. I can clean my desk, tables, counter tops, mirrors, or even windows with these, and they lift up all the dirt, stains, or anything else that I throw at it. It's quite possible that they are the best cleaning product I have ever used. It is so much easier using these then a bottle of disinfectant spray and paper towels. Paper towels leave little fuzz balls everywhere, and usually they aren't that sturdy. These wipes are stronger, and don't leave any residue or anything like that. I have to say that they are the most convenient, and best cleaning product that I have ever used, and I will continue to use them until something better comes along, if anything ever does. I clean these wipes to clean wood, furniture, tile, porcelain, mirrors, windows, plastic, and just about everything in my home with it. I especially love them for cleaning my kitchen and the bathroom. Thanks for sharing your Lysol wipes review Millie. In addition, you mentioned that you clean your glass and mirrors with this product. I never saw specifically that the product can be used in this way. I don't think it would hurt them, but in my experience when I've used some cleaning wipes on glass it has smeared. Has anyone else used these wipes on glass? If so, please share your disinfecting wipes review here, for this or any other brand, telling me your experiences with it, and also how it worked on glass if you ever tried that. Rose has shared her review of the type of Lysol wipes known as dual action wipes. These are a specific type of wipe that have two sides, one for scrubbing and one for wiping. In my opinion Lysol disinfecting wipes (Complete Clean) are the best cleaning wipes that are available in the market today. I really like the fact that they have two sides, one for simple cleaning, and another scrubbing side for tough messes. This helps, when you have a baby running around who always has sticky hands. I use them on just about everything you can think of, from counter tops, to baby toys, and even to get hard to clean messes off of the floor. I also use them on tables, highchairs, kids toys, tubs, toilets, sinks, walls, fridge, and kitchen appliances. The scent of the wipes is great too; they leave whatever you clean smelling fresh and clean (I use the citrus scent). This scent is a plus if you like things to be clean, and smell good too! These wipes come in many different package sizes, so if you’re just trying them for the first time, I would suggest that you buy the smaller package, just to see if you will like them. Which I am sure you will. It is important to me that the wipes are disinfecting, because I want to know that I am not only cleaning my house, but that I am also getting rid of things that could make us sick. These are the only cleaning wipes that I will use in my house. They clean well, they disinfect, they make cleaning easier, and they smell great. What more could you want out of a cleaning product? Thanks Rose for sharing your Lysol wipes review. I've got several more reviews of these wipes below, and am always looking for more reviews. You can share your disposable cleaning wipes review here, or read other reviews already submitted. I recently tried the Lysol Power & Free toilet and bathroom wipes, since I was intrigued about the use of hydrogen peroxide to help clean and disinfect surfaces, instead of bleach. I didn't just use it for cleaning my bathroom though, but for all over my house, including my kitchen as well. They are great for quick clean ups and spills. As long as you keep the top of the container closed the wipes stay moist (my kids sometimes don't close it well, but that is user error, not a design problem with the container). They also are quite sturdy, and can scrub well, which I appreciate, so I don't have to use as many when there is a stubborn spot on the sink or counter that I need to deal with. The only thing about them which wasn't necessarily bad, but that I really noticed every time I used them was their smell. They have a medicinal smell to them that the added scent just wouldn't hide. I assume it is from the hydrogen peroxide they contain, and it was similar to the scent from the Lysol Power & Free toilet bowl cleaner that I also used (click the link for a review of that product as well). The scent dissipated with time, but stayed on my hands for a while which can be rather disconcerting, so I often washed my hands after using these wipes as well. Overall, I liked this product and would purchase it again, especially if I had coupons that I could combine with a sale. I'd love to hear from even more people who've used this or any of the other products from Lysol's new Power & Free line, which all use hydrogen peroxide for cleaning instead of bleach. You can share your reviews here. Amanda has also shared her Lysol disinfecting wipes review. 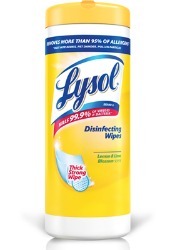 I absolutely love Lysol Disinfecting Dual Action Wipes, in the crisp linen scent. One side has stuff on it to make it easy to scrub through harder things and the other side is great for just wiping and disinfecting surfaces. I use these wipes on pretty much everything. For example, these work great on the counter tops in the kitchen. If it’s food that’s stuck onto the counter I just use the scrubber side, for everything else I just use the other side and wipe the mess away. I also use them for the microwave, outside of the oven, walls, and the kitchen floor for quick touch ups. They also work great in the bathroom too. They make it so easy to clean the outside of the toilet and sink. I love that just a little wipe and viruses and bacteria are killed and the mess is gone! These wipes make it so easy, and they smell great too! I recommend these wipes to everyone, including to my friends because they work so well. It is important to me that these wipes are both antibacterial and disinfecting because I have a young child, and I try to keep things as clean and healthy as possible for him. Thanks Amanda for sharing how you use Lysol wipes in your home. It sounds like you really use these wipes as a general purpose cleaner, letting them clean a wide variety of surfaces and messes for you. What about other readers? What do you use to disinfect surfaces in your home? You can share your antibacterial and disinfectant cleaners review here, or read other reviews already submitted. 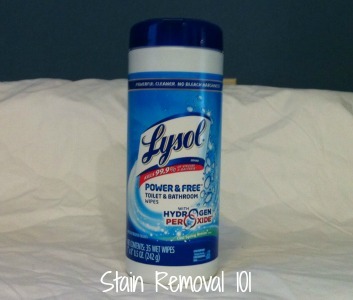 Sara has also shared her Lysol wipes review, and how she uses them in her home. 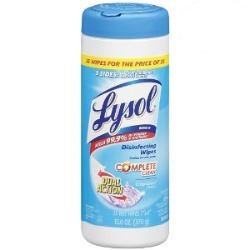 Lysol has been a mainstay in my home for a number of years, because of how well it cleans. Then, once they introduced these wipes cleaning has gotten even easier than before. 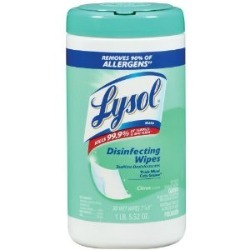 Lysol wipes can be used on a lot of different surfaces. For example, I use the wipes to clean almost everything in my kitchen. One of the reasons I chose Lysol Wipes over the other wipes is the fact that the Lysol smell is very appealing to me. With hints of citrus my kitchen always smells fresh after a good clean. Considering they are so cheap (I often find them on sale, plus have coupons), there is no reason not to use them in your house or even at work. They've provided me a cheap and quicker way to clean. I have highly recommended them to my friends who have grown to love them as well. Thanks Sara for your Lysol disinfecting wipes review. As you can see from all the reviews above, there are many people who really love these wipes for cleaning their home. I would love to hear more reviews and uses for these wipes around your home. You can share your disinfecting wipes review here, or read other reviews of other brands that have already been submitted. 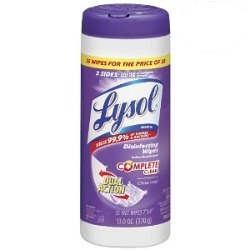 Can you use Lysol Disinfecting Wipes on car widows and mirrors? I have used the wipes with my Swifter in a pinch when I ran out of the regular ones. I don't care for the scent of the bleach. I got 'burned out' on it at work because the housekeepers used a concentrated formula. It was all I could do to stay in the area, so I try to stay away from it if at all possible. My husband is very sensitive to smells/odors since being in a construction area with a citrus scented solvent. So you can tell how he feels about that. The Disinfecting Wipes say they are Bleach-free. With the Fresh Scent and even the Citrus Blend, he has no complaints.